In addition to electrical installation testing, instruments in the new range are suitable for applications that include cable testing, motor testing, automotive maintenance, verification of electrostatic discharge (ESD) precautions, testing of control panels and use in the avionics industry. The range currently includes four models. The MIT400/2 is a competitively priced entry-level instrument with the capability to test insulation at 250 V, 500 V and 1000 V. The MIT410/2 adds test voltages of 50 V and 100 V as well as provision for polarization index (PI) and dielectric absorption ratio (DAR) testing. The MIT420/2 and MIT430/2 provide all the functionality of the MIT410/2, but add the invaluable new feature of variable test voltage, which can be set in 1 V steps from 50 V to 1000 V. This feature allows the instruments to cope with awkward insulation test requirements where standard test voltages may not be suitable. The MIT420/2 and MIT430/2 also have facilities for internal storage of results, which can be subsequently download via a wireless Bluetooth link with the MIT430/2. The MIT420/2 and MIT430/2 also include rechargeable battery capability, with chargers available for use from the mains supply, or from a vehicle accessory socket. All models in the range offer an enhanced fast continuity test feature, with auto-ranging for measurements from 0.01 Ω to 1.0 MΩ. Continuity tests can be performed at either 200 mA or 20 mA, to suit the requirements of the application. 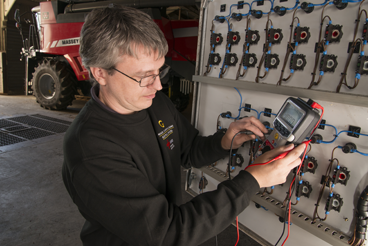 The instruments also offer voltage measurement up to 600 V AC and DC, with AC measurements being true RMS (TRMS). 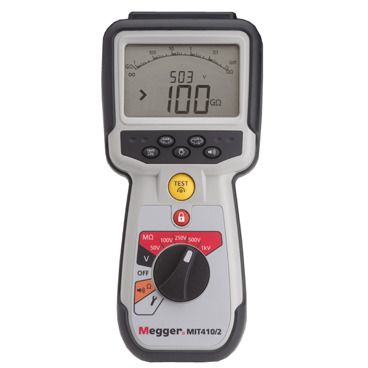 Megger’s new MIT400/2 insulation testers have been designed from the outset with safety in mind. They have a CAT IV 600 V safety rating in line with EN 61010, which means that they are suitable for use on all sections of low voltage electrical installations, and they incorporate live circuit detection and protection that automatically inhibits testing and provides a warning if the instrument is connected to a circuit where a voltage is present. Like all Megger instruments, the new MIT400/2 insulation testers are built to withstand challenging on-site conditions without damage. They have a tough shock-absorbing rubber over moulding that provides excellent grip, and they feature weatherproof IP54 protection. In addition, the instrument has a bar at the top to allow the addition of future accessories, such as magnetic hanging straps and belt loops.